Colorado chain laws are now in effect. 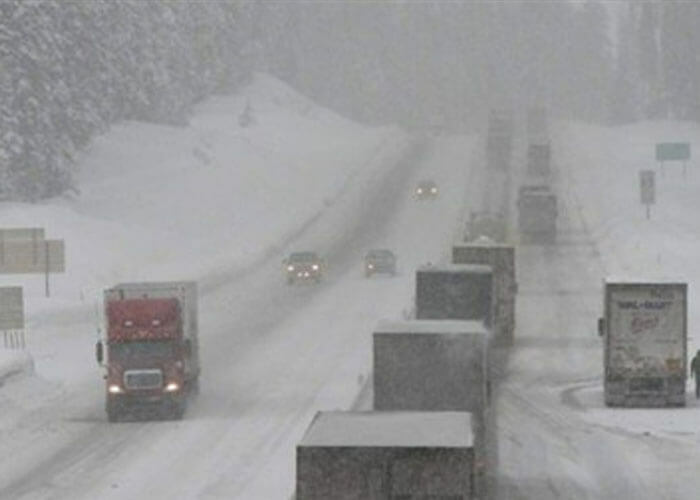 Each year, from September 1 to May 31, the state of Colorado requires all trucks that are traveling on I-70 between Morrison and Edwards to carry chains. The law applies to all CMVs with a gross combination weight of 26,001 pounds or more. Chain Law Level 1/Code 17 All single drive axle combination commercial vehicles must chain all four drive wheels; cables are not permitted as ATDs. All other commercial vehicles must have snow tires or chains. Level 1/Code 17 may be implemented any time there is snow covering any part of the traveled portion of pavement on an ascending grade. Chain Law Level 2/Code 18 All commercial vehicles must chain up. Single drive axle and tandem drive axle combination commercial vehicles must chain four drive wheels. Autotransports must comply to the extent possible without causing damage to hydraulic lines. Buses must chain two drive wheels to comply. Level 2/Code 18 may be implemented any time there is snow covering the entire traveled portion of pavement on an ascending grade, or when driving conditions dictate that this level is necessary to protect safety. When the chain laws are in effect, drivers will be notified via electronic message signs, 511 traveler information and media outlets. “Chains must consist of two circular metal loops, one on each side of the tire, connected by not less than 9 evenly-spaced chain loops across the tread. Commercial vehicles that have 4 or more drive wheels must chain 4 wheels. Dual tire chains are acceptable,” Colorado Department of Transportation states. Colorado approves the use of Alternate Traction Devices (ATDs). Wheel sanders, pneumatically driven chains and textile traction devices (TTD) are allowed, however, the only TTD that has been approved for use is the AutoSock. “Tire Cables- With only two exceptions, Colorado chain law rules do not permit tire cables as alternate traction devices. The exceptions are: 1) tire cables with high strength steel cross member rollers 0.415” or greater in diameter, which can be used on all commer- cial vehicles except single drive axle combinations; and 2) on a tandem power drive axle commercial vehicle, where any type of cable can be used only if there are chains on the two outside tires of one of the power drive axles and cables on two or more tires of the other power drive axle,” Colorado Department of Transportation states. Chains are not required for trailers. Hazmat drivers may pass the chain-up signs and install their chains at a safe location outside the travel portion of the highway. Where are chain-up stations located? I-70 westbound: mileposts 358, 263, 260, 254 (Buffalo Overlook), 228, 223, 221, 219, 213, 197, 179 I-25 northbound: milepost 157 I-25 southbound: milepost 172.